This aromatic blend is oh so sweet with a kiss of cinnamon and spice. Add a new twist to your breakfast by sprinkling it on toast, cereal, fresh fruit, or try it to your muffins, cakes, pies, and other baked goods. A wonderful addition to puddings, custards, and sweet sauces. Exceptional on plain perdu (French Toast) and New Orleans-style bread pudding! 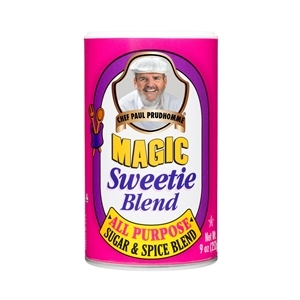 Just substitute Sweetie Magic™ for sugar, and notice the difference! Ingredient: Sugar, spices, salt, natural lemon and lime flavors.